(Newser) – It's one small step for a company, but it could be a giant leap for capitalism. On Wednesday, the Federal Aviation Administration gave a company called Moon Express permission for an unmanned lunar landing, making it the first private company the US has approved for a moon mission, the BBC reports. 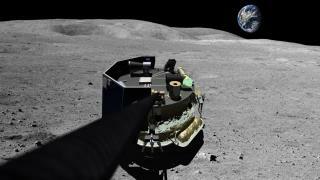 "In the immediate future we envision bringing precious resources, metals, and moon rocks back to Earth," Moon Express co-founder Naveen Jain says, though the FAA-approved mission, which the company hopes to carry out next year, will only involve sending a lander the size of a suitcase to the moon to beam back images. That will win the company Google's $20 million Lunar XPrize—unless another private organization gets there first. ". . . we envision bringing precious resources, metals, and moon rocks back to Earth." Please name one precious resource or metal found on the moon. Moon rocks themselves are no different than those found on earth, except that they cost millions of dollars per pound to haul.